Place cubed eggplant in a colander. Toss eggplant with approximately 2 teaspoons salt. Let drain 30 minutes. Pat dry with paper towels. Tilt baking sheet slightly so that excess oil and water drains away and allow to cool. Toss vegetables with garlic, basil, salt and freshly ground black pepper to taste. Reduce oven temperature to 400 degrees. Line a baking sheet with parchment paper. Sprinkle a light layer of cornmeal over the parchment paper. 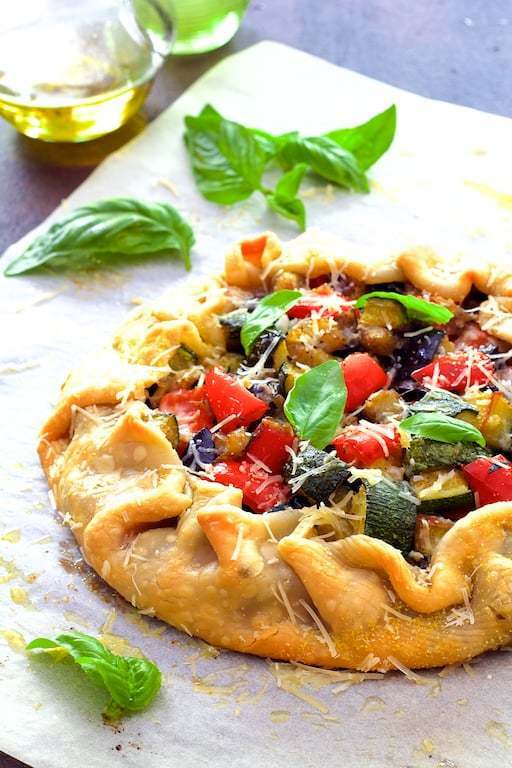 Brush the pastry with olive oil. Bake for approximately 30 minutes or until crust is golden. Sprinkle with remaining Parmesan cheese. Cut into wedges and serve.